Granite is a excellent material for floors and kitchen countertops. Granite is an igneous rock, meaning that it was formed with heat and pressure deep within the Earth’s crust. The minerals inside the granite appear as small flecks throughout the stone. There are many types of granite. Some have veining and look similar to marble. Granite, being a dense-grained, hard stone, can be highly polished in a variety of other ways. Granite is available in a broad spectrum of colors. Granite can be found right here in the U.S. and also from the mountains of Italy, India, Brazil, China. Granite’s durability and beauty make it one of the most popular natural stone choices available. Granite is the perfect material for kitchen countertops. While synthetic surfaces can scratch and melt under hot cookware, granite resists heat and scratching. 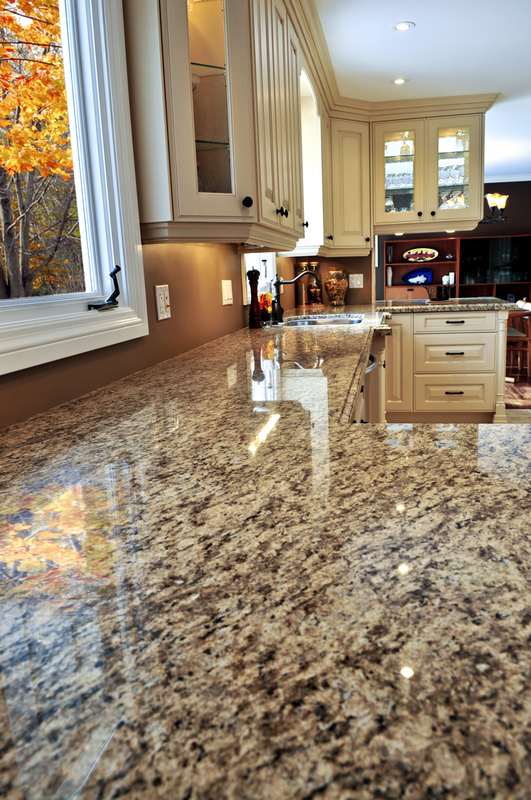 Granite is relatively most bacteria-resistant because it is not porous. 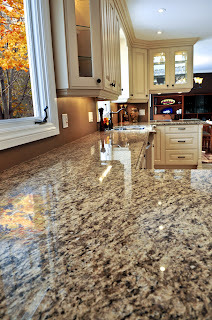 Granite is durable and retains its color and is not affected by lemon juice, coffee, tea, alcohol, or red wine. It is also scratch resistant and easy to clean with mild soap and warm water. Because granite naturally comes in a variety of colors and is strong, durable, and stain resistant, it is ideal for kitchen countertops, food prep surfaces, table tops, floors, cladding, paving, and curbing. Granite countertops should be sealed with a high quality stone sealer. Ask your contractor if your granite is already sealed or if needs to be sealed. Have it professionally sealed during installation. Stone surfaces then need resealing about once a year. This you can do yourself or you can have a professional seal the granite for you. Sealing your granite surface is relatively easy and inexpensive to do yourself. To seal a granite surface, clean the granite with a mild detergent that does not contain ammonia. When cleaning granite, avoid using Windex or other products with ammonia or solvents. Ammonia will remove the sealer. Solvents will do the same. Allow the surface to completely air dry for several hours. Next apply a high quality stone or granite sealer according to the manufacturer’s directions. Wipe off the excess as per package directions.